The construction of our Tungsten Carbide Tipped Circular Saw Blades comprises a circular steel disc to which carbide tips are brazed along. Available in a variety of sizes along with different diameters, these blades are rust proof and non-abrasive. Further, we source only high quality stainless steel to develop these blades with longer functional life. 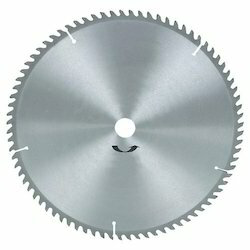 Looking for Tungsten Carbide Tipped Circular Saw Blades ?